Engineers from the European Space Agency (ESA) have been trying to determine why the lander Schiaparelli crashed into the surface of Mars on 19th October, which according to imaging from NASA caused the lander to explode on impact. Schiaparelli was intended to test the soft-landing systems which ESA plans to use for the ExoMars mission to deposit its robotic rover and science suite safely on the Mars surface in 2020 when the rover will drill into the surface to look for chemicals that could indicate the presence of past life. The lander reached Mars with the Trace Gas Orbiter satellite, and began its descent according to plan. It was monitored by the Giant MetreWave Radio Telescope in India but shortly before it was due to touch ground, the telescope lost contact with Schiaparelli. NASA’s Mars Reconnaissance Orbiter returned images showing a large amount of disturbed ground at the landing site, leading the mission team to conclude the lander had been destroyed. However, it sent telemetry data back to the TGO throughout its descent, and flight engineers are now analysing this data to try to determine what went wrong. According to Nature, the team has determined that four minutes and 41 seconds into the six minute landing sequence, the lander’s heat shield and parachute both ejected. Its thrusters, which were supposed to fire for 30 seconds to decelerate the craft to a soft landing, engaged for only three seconds. In theory, because the heat shield and parachute were gone, Schiaparelli’s on-board computer thought it was already on the ground. The NASA images suggest it hit the ground at about 300km an hour, indicating that it had dropped uncontrolled for around 2km. If, as the team suggests, this is a software problem then it should be possible to fix it for the ExoMars landing craft. The team intends to replicate the failed landing using a hardware and software simulator and Nature reports that project scientist Jorge Vago does not believe this will cause any delay to the next phase of ExoMars. However, he is concerned that the landing failure may lead to caution from European science ministers when they are asked to release more funding for the mission at a meeting in December. 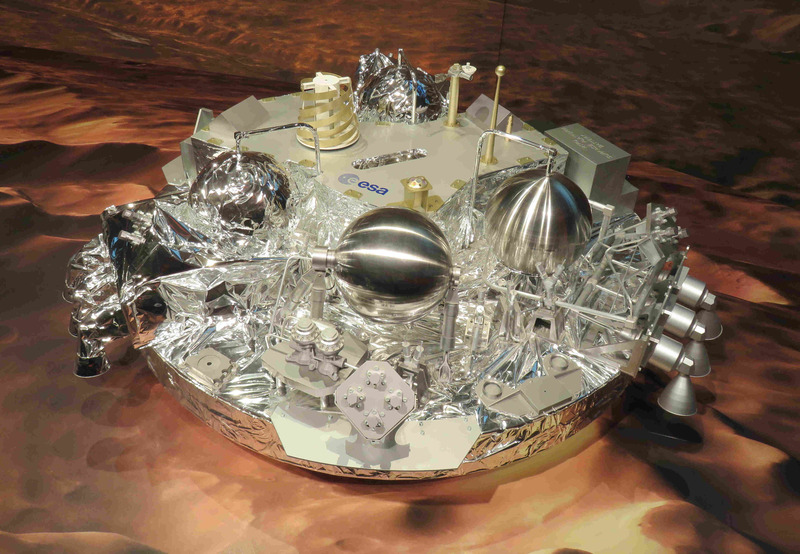 The TGO appears to be fully functional and in around a year’s time it will begin searching the Mars atmosphere for traces of methane that might have had a biological or geological source; its second function is to act as a communications relay for the ExoMars Rover in 2020. Looks like the latest software patch didn’t get installed in time! Inadequate testing of all the permutations that could arise including fault conditions? Suggests short cuts, or a ‘that’ll do’ approach. Something similar happened to the NASA Mars Polar Lander back in 1999. It also happened to the Mars Orbiter the same year – Do we not learn from the past? They should use a gyrocopter type method for landing the craft after the chute has done the initial slow down. This way there is no rocket system to go wrong & it would be a soft landing! I expect for the control of such systems a majority voting approach with 3 programs generated by 3 teams with no contact in between and in different languages. The probability to have same error in 2 programs at same place will be drastically reduced. Today components are so small that this solution is without difficulty possible to implement. If it was not done they took a disproportioned risk.